According to American Wild Horse Preservation, more than 270,000 mustangs have been removed from public lands since 1971. Approximately 36,000 horses adopted through the Bureau of Land Management (BLM) are unaccounted for, and the BLM estimates up to 90% of adopted mustangs end up at slaughter. These three mustangs were rescued by The Mustang Project, and are typical examples of what happens to horses that are removed from their habitat by BLM. This is in addition to the over 50,000 horses in BLM short and long-term holding facilities. Shelby is what is considered a "readopt" by the BLM. He was adopted, but then before the one year period was over for the adopter to get his title, they returned him to the BLM. Fortunately for Shelby, he went into a foster home and not back to the BLM holding facility. Going back to a holding facility would have given him another "strike". Each time a horse is offered for adoption and does not get adopted, they get a strike. After three strikes, BLM can sell them "without conditions", meaning he could have been sold to someone who could have shipped him directly to slaughter. (All horses over 10 years of age are automatically allowed to be sold "without condition".) His adopters had done some work with him, and the foster home worked with him as well. Going back to a holding facility would have undone any training he had as he would have been put back with all the other wild horses. 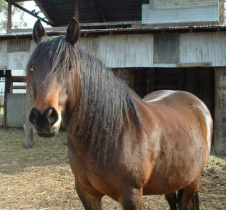 Shelby is super friendly, smart, very tolerant, and has been ridden. Shelby is from the Devil's Garden HMA in north-eastern California. How many horses are adopted from the BLM and returned? How many people just wait to get the BLM Title and turn around and sell them at auction or give them away? Many people are not really prepared to gentle or train a mustang, and sadly Craigslist is full of such horses. At the young age of 2 years old, Doc was considered a "three strikes" mustang. He was sold "without condition" to someone who bought truckloads of three strikes mustangs and put them on his ranch in Nebraska. The horses were not cared for, countless horses died at the ranch, and over 200 horses, mostly mustangs, were rescued from the brink of starvation. The Mustang Project, with the help of Lifesaver's, was able to take in one of the rescued mustangs. Here is Doc after he was rehabilitated. Because Doc was already 6 years old when he came here and was never handled, we decided he would live out his life here on his own terms. We've worked with him with target training, and he is just now letting strangers approach and pet him. He's come a long way since he's come here and we continue to work with him at his pace. Doc is from the Murder's Creek HMA in Oregon. How many "three strike" horses are purchased (at $10 each) and sold directly to slaughter? Wyatt is our latest rescue. He was Titled by his adopter, and the very next month sold at auction to a "kill buyer" - someone who buys horses at auctions specifically to ship them to slaughter in Canada or Mexico. We found out about him and were able to raise the funds 24 hours before he was due to ship. 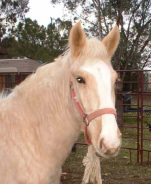 As with many of the horses that are bought for slaughter, Wyatt was healthy, and had no vices or physical defects. He loaded right up in the trailer, leads, and picks up his feet. He is being clicker trained and is making great progress and his confidence is growing every day. Wyatt is well mannered, as sweet as can be, and a real snuggle-bug. Wyatt is from the Antelope Valley HMA in northern NV. It is one of the HMA's that is being zeroed out by Madeline Picken's Mustang Monument and being replaced by a non-reproducing herd. Because of a generous sponsor, we were able to rescue and care for Wyatt. Thank you Betty S. for your sponsorship!!! Far too many mustangs end up going to slaughter, either because the adopter does not have the knowledge or patience to work with a horse that has never been handled, or they, like many horses, are passed from home to home and eventually end up at auction or purchased by a kill buyer posing as a good home. Spirit was rounded up from the Devil's Garden Herd Management Area in NE California when she was 5 years old. This is the same HMA as Shelby. We don't know her whole story, but at some point her original adopter couldn't keep her and she went to several different homes before she ended up being listed on Facebook for $200, at the age of 16. At this price, and with minimal training, she was very much in danger of ending up in the wrong hands. Since she lived just around the corner from where we buy our hay, we offered to take her. We spoke to a previous owner, and based on her experiences with Spirit, we felt it was bet to let Spirit be wild. She is currently in Corning with several of the Sheldon mares. Sponsor a Horse or make a donation. If you are interested in sponsoring one of the horses or would like to make a one-time donation, click on the Donate button to the right. For more information, please click here.